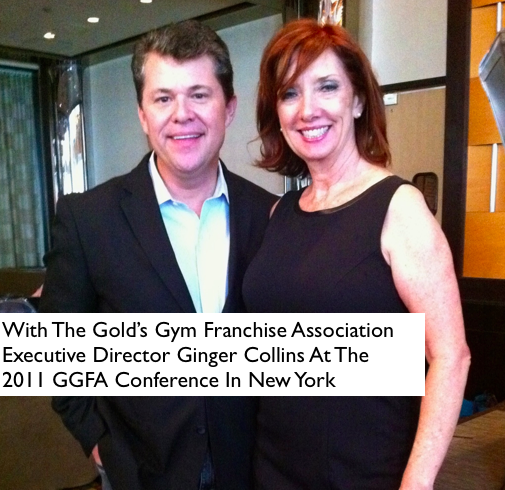 From Bryan O'Rourke - GGFA Conference In New York City - September 27, 2011 full disclosure - I sit on the GGFA Think Tank and Represent Star Trac and Michael Bruno personally. Its been an interesting few weeks for me that's been steeped in the Gold’s Gym brand. After spending time with the GGI executive team in Dallas a few weeks ago and participating in a GGFA related diabetes golf benefit in New York with friends Bill Austin, Mike Epstein and his partner Art, among others, I arrived in New York last Sunday for the GGFA convention. Gold’s has been in the news lately and so it was fortuitous for me to hear from the brand’s leaders both on the franchise and company side. As always Ginger Collins and the entire GGFA team put together a great show and I was thrilled to spend time with so many of our GGFA friends as well as Michael Bruno, owner of Star Trac, Stairmaster and Land America, my partner Robert Dyer and Sal Pellegrino of Star Trac, among many other wonderful health club industry leaders. (Let me put in a special mention for the “Godfather” and my friend Bill Austin). GGI is very focused on the express model as part of its growth strategy. With rumors of a possible Bally’s acquisition still heard faintly in the background, I wonder what the next few years holds for the Gold’s brand. Based on what I saw it could be very positive. So tell me, Bryan O’Rourke, what do you think about the Gold’s brand, the GGFA and the future for this storied health club chain ? I’d love to hear your feedback and thanks for reading the post ! Bryan O’Rourke is a health club industry expert, technologist, financeer, shareholder and executive in several fitness and health club business service companies. He is also a partner in The Health Club For Women and Chairman of the Medical Fitness Association’s Education Committee. To learn more contact Bryan here today .